Never have we had eggs like this in the dead of winter. 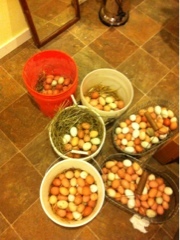 It's true that we have twice the number of laying hens than a year ago. But a year ago we did not have a dozen eggs a day. This year we are getting many dozen each and every day.